I can’t believe it’s been a year already! I still recall getting the January, 2007, issue of Martha Stewart Living after the flurry of holiday activity last year and feeling that warm urge to cleanse and purge and de-clutter everything in my life. My friend Kenn goes through a ‘Winter White’ phase after the holidays, which he credits to the annual January issue, which is all about the streamlining of the home, cooking warm but light foods and making sure everything in life is fresh and whittled down to the essentials, ensuring a clean slate upon which to design a new year. I recently took out the last twelve issues of the Martha Stewart Living to have a look at the year that was. You have to understand that I’m not your typical reader; I analyze, scrutinize and evaluate this magazine, much to the dismay of some and the delight of others. Friends within my ‘Martha Circle’ shake their heads in amazement when I can recall the exact issue an article on African Violets appeared – often able to cite the page number, too! Sad, I know, but I’ve become something of a walking, talking Martha Stewart Living index. More than this, I take it upon myself to critique the magazine, often imposing some of my own views on what I think is missing in an issue, how something might be done better or how an idea presented in the magazine could be more easily conveyed. Oh, the arrogance! I can just hear Martha now: “Who does he think he is?” Well, I’m Andrew. I’m a long-time subscriber, a natural-born information seeker, a hobbyist, a baker, a designer, a journalist and a lover of magazines. I suppose I feel a certain sense of entitlement to critique and evaluate the things I pay for. As a customer, it’s sort of my right. Right? Most of the time, I’m left astonished and deeply inspired by the beauty of the design, the power of the photography and the brilliance of the content in the magazine. As I was looking back through this year’s issues, I decided to compile a little dossier on the 2007 offerings, jotting down notable observations and picking some favourites. I was a bit ruthless here, too. 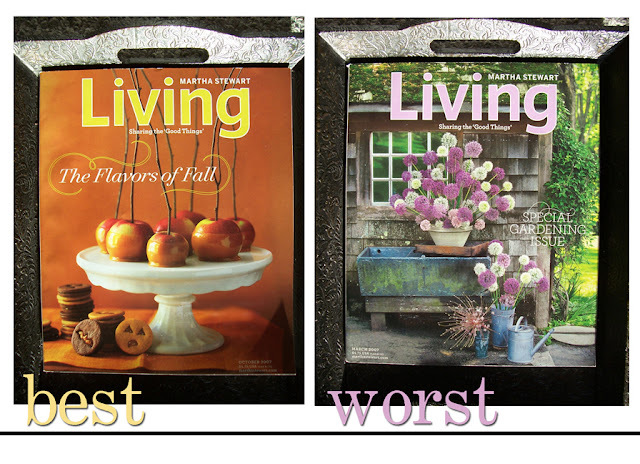 I picked the ‘best’ and the ‘worst’ issue of 2007 (see more below) although it must be stated that each issue of Martha Stewart Living surpasses anything else on the newsstand in the home/lifestyle category. Read on for some of my observations and criticisms. The Lady of the House appeared on the cover of her magazine three times in 2007 – a fairly substantial escalation in self-promotion, compared to previous years. In 2006, she appeared on the cover just once on the January issue – twice, if you count the alternate subscriber issue for July, but that one didn’t appear on newsstands. In 2005, she appeared only once, on the April issue. Between 2000 and 2004, she didn’t appear at all, except on the cover of the 10th anniversary issue: January, 2001. 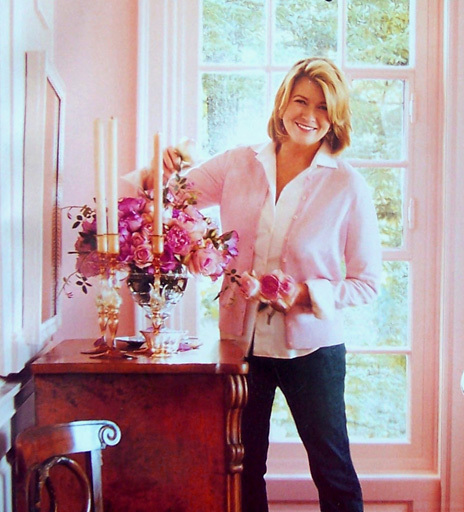 In May, September and December of 2007, Martha greeted the reader on the cover like a welcoming hostess. This is likely being done to help promote the television segment of the company, which is struggling a bit in the ratings. I quite like seeing Martha on the cover. I think Martha is exacting herself in a timely and fashionable way. I do question, though, the long-term strategy of this: associating the brand too closely, again, with its founder. We saw what happened when she went to trial. Ultimately, the company must retain some autonomy from Martha if it is going survive well into the millennium, but I like that she’s having fun with herself. Of these three covers, my favourite is the May issue. I think she looks stunning. I like the full-length shot of her; I like her natural expression; I like the room she is in and the warm tones. Regarding the May issue, this one marked a new feature for the magazine: the first colour issue. Martha’s guesthouse at Skylands was the canvas for a pretty palette of pink hues. As the years unfold, I’ll be looking forward to more colour issues. 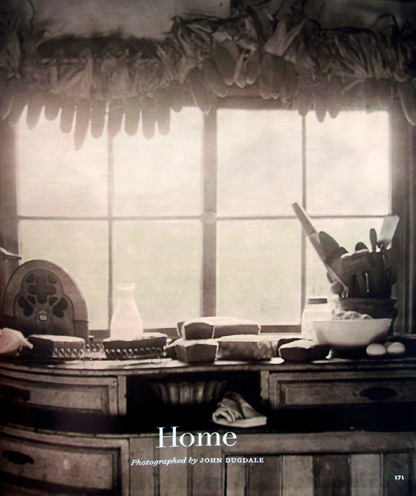 Margaret Roach passed the editor’s torch to Michael Boodro last summer; he now assumes the role of Editor-in-Chief of Martha Stewart Living. Maggie will go on to do more work in her capacity as the Chief Editorial Director of the company, overseeing all the editorial and content details, from publication to publication, ad-campaign to ad-campaign. She’ll be a busy bee. Boodro has written for MSL before and has done substantial work in the magazine industry. He is former Editor-in-Chief of Louise MacBain's Culture + Travel and was an editor at the New York Times magazine. He is a natural fit. I’ll miss Margaret’s letters, which were so nicely written, and I think she deserves a medal of valour for the way she steered that magazine through its most troubled time, during Martha’s trial. But, I think Michael will bring a new flare to the magazine that I felt was being slightly overlooked under Margaret’s loving but traditional care. He is gay and fashionable and reeking of taste. This bodes well for a magazine that is always kind of precariously hovering over ‘Grandma’ territory. He will revitalize it in subtle ways that won’t blow the core demographic out of the water but that will lure new, younger readers to its pages. An excellent photographer was chosen to render a different photo each month. This element proved to be one of the most interesting and anticipated features for me. Now comes the fun task of choosing the best issue and the worst issue from the 2007 roster. Choosing the best was not an easy task, since even the worst issue is a decent one. I had a few criteria for the selection process: Was the cover impacting, appropriate yet unusual (unpredictable) and enjoyable to look at? Is the content scintillating and engaging on almost every page? Do I refer back to the magazine often? Are the design elements attractive and do they work effectively? Is the photography excellent? Are the projects inspiring? Are the instructions and recipes easy to follow? With those questions in mind, I began to scour the past issues, going page by page, article by article and photograph by photograph? As I said above, choosing the best was not easy. Even the issue I chose had at least three others that were waiting in line as potential winners. I always look forward to the special gardening issue. It comes in March when the snow is just starting to thaw and people’s minds are turning to the outdoors. It is usually an extraordinary issue. Perhaps I had the bar so high that the 2007 issue just couldn’t measure up. The 2006 issue was stunning, from start to finish. But there was something decidedly boring about the ’07 issue. First of all, the cover is a real let-down. I know that Martha is responsible for selecting the cover every month, but she must have been a bit tired that day. It’s a decent photograph: that charmingly rundown shed on Turkey Hill with the bubbly assortment of alliums and the rustic tin containers. Maybe it’s the colours (that triste shade of lavender in the title – yuck!) or the jumbled composition that leaves me kind of unimpressed. It’s not striking. It’s not alluring. Inside, much of the content is totally predictable. It wasn’t too long ago that we had articles on tomatoes and clematis, and yet here they are again. The spring ephemerals are cute but not really that provocative. The article on ribbon embroidery is positively ‘Granny’ and the menu of first-of-season vegetables from the garden just looks dull and unappetizing on those grey-blue surfaces. It’s not all bad. The article on patios is quite attractive, as is the article on alliums. The lush seaside garden of Carol Johanson makes me want to venture through it carefully, and the pistachio tart (Dessert of the Month) looks to-die-for. Overall, though, it was a quick read – not at all the usual languorous study I’m used to. Of the 2007 issues, I was most disappointed by this one. Looking back over the year’s issues, it seems almost inevitable to me that this one would garner the ‘Best’ label. It heralds some interesting changes, including a new letter from the editor, Michael Boodro, and a new feature called “Healthy Living,” which promotes a good diet and mental health, and explores some common ailments and how to deal with them. Aside from these new features, the issue showcases one interesting subject after another with a focus that feels fresh. The cover is not a trite ‘seen-it-before’ Jack-o-Lantern but a cake stand full of caramel apples with long twigs emerging from their tops, and a few Halloween cookies scattered about the base. It is original, surprising and different but still hints at the fall celebrations so many of us enjoy. Inside, too, the Halloween ideas seem different and unique. The carvings on the pumpkins are not face shapes but candelabra and goblets and quill pens, run-down picket fences with hovering ghosts, scenes of scattered leaves and cobwebs: spooky and challenging and new. An article on copper and brass collectibles is a warm meditation reminiscent of past issues but still looks modern. The ubiquitous Chrysanthemum is given new importance in a showcase of some of the rare Asian varieties and a look back at Martha’s beloved Turkey Hill Farm reveals a lifetime of achievement and cultivation, even with a glimpse at the bare rooms that were left void after her move to Bedford. The October issue brings so many of the best elements of the magazine together in a way that is lovingly and refreshingly presented. Nothing in the issue feels predictable and yet its subjects do not deviate too far from the topics and celebrations of the season, which is very important. The year to come looks promising, too. Mr. Boodro has said that this year he will have more say in how the magazine is put together. I’ve already observed some small changes in the January 2008 issue; the Ask Martha column has moved further into the magazine, closer to the well; the 'Do You Know' page has changed in design and there are more people in the photographs (many of them men) and there is a bit more of a youthful glow to the pages, it seems – perhaps seeping in through the use of colour or modern furnishings in the photographs. Whatever approach “Living” takes this year you can bet I’ll be taking note! This my dear friend is a wonderful recap of the year. I do agree with your selections for 'best' and 'worst' of the year. Bravo! I'm a bit wary of the new editor. I'm afriad it will become too much like Blueprint, which obviously didn't capture anyone's imagination. I'm not sure Martha, or MSLO, knows who they are anymore. She wants to appear "hipper" and appeal to the younger crowd, but many in that demographic barely know who she is, or only do so through their mother,etc. It also bothers me that Martha has been air-brushed to death and made to look like she's 30, especially in her Christmas issue. She really doesn't need that - she is a stunning, handsome woman who wears her age well. The photo re-touching is so overdone and over-the-top, it makes you roll your eyes and go, "Sheesh!!" Wow! How did I ever miss your cool blog? I'll be linking your blog from mine this week. I'm a total Martha groupie too. I adore the crafts from her magazines and books. -A Fellow Canadian Martha Fan!